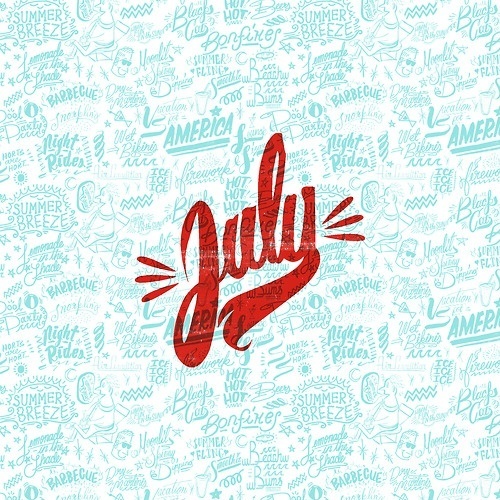 According to the Gregorian calendar, July is the seventh month. On the Roman calendar, it was the fifth month and it was called 'Quintilis', menaing 'fifth'. Julius Ceasar gave the month 31 days in 46 B.C. The Roman Senate named it 'Julius', in honor of Caesar. July is usually the hotest month of the year in the Northern Hemisphere. July is one of the winter months in the Southern Hemisphere. The climate is mild in most of the Southern Hemisphere, with the exception of the COLD Antarctica, and the cold,rainy part of South America. During July, when there isn't much rain, the grass often loses it's greenness. Some flowers are abundant in July, because they strive on the heat. Also, insects are abundant as well - life is striving in July! Independence Day is observed in the United States on July 4. On that day in 1776, the Continental Congress adopted the Declaration of Independence. In France, a similar holiday, Bastille Day, occurs on July 14. Several other countries celebrate national independence in July. Canada celebrates July 1 as Canada Day. Independence Day is celebrated in Venezuela on July 5; in Argentina, July 9; in Belgium, July 21; and in Peru, July 28. The Ruby is the gem for July. The water lily is the flower for the month of July. Kentucky became the 15th state, June 1, 1792. Comte de Rochambeau, French commander in the Revolutionary War in America, born July 1, 1725. The British North America Act went into effect, establishing the Dominion of Canada, July 1, 1867. American troops occupied San Juan Hill in the Spanish-American War, July 1, 1898. Battle of the Somme began in World War I, July 1, 1916. President James Garfield shot, July 2, 1881. Sherman Antitrust Act passed, July 2, 1890. Thurgood Marshall, first black justice of the Supreme Court of the United States, born July 2, 1908. Champlain founded Quebec, July 3, 1608. Furniture designer Robert Adam born July 3, 1728. John S. Copley, American painter, born July 3, 1738. Composer George M. Cohan born July 3, 1878. Idaho became the 43rd state, July 3, 1890. Continental Congress adopted the Declaration of Independence, and John Hancock signed it, July 4, 1776. Nathaniel Hawthorne, American author, born July 4, 1804. Work began on the Erie Canal, July 4, 1817. Stephen Foster, American songwriter, born July 4, 1826. Vicksburg surrendered to the Union Army in the Civil War, July 4, 1863. Calvin Coolidge, 30th President of the United States, born in Plymouth Notch, Vt., July 4, 1872. First Pacific cable, running between San Francisco and Manila, opened by President Theodore Roosevelt, July 4, 1903. P. T. Barnum, American circus owner, born July 5, 1810. Amendment 26, which sets the voting age at 18 in the United States, was proclaimed, July 5, 1971. John Paul Jones, American naval hero, born July 6, 1747. British troops captured Fort Ticonderoga, July 6, 1777. The Republican Party held its first state convention, at Jackson, Mich., July 6, 1854. Japanese and Chinese troops clashed, beginning the struggle that became World War II, July 7, 1937. John D. Rockefeller born July 8, 1839. Elias Howe, American inventor, born July 9, 1819. Protestant leader John Calvin born July 10, 1509. J. A. M. Whistler, American painter, born July 10, 1834. Wyoming became the 44th state, July 10, 1890. John Q. Adams, sixth President of the United States, born in Braintree (now Quincy), Mass., July 11, 1767. Aaron Burr killed Alexander Hamilton in a duel, July 11, 1804. Author Henry D. Thoreau born July 12, 1817. Inventor George Eastman born July 12, 1854. Andrew Wyeth, American painter, born July 12, 1917. Mary Emma Woolley, American educator, born July 13, 1863. Gerald R. Ford, 38th President of the United States, born in Omaha, Nebr., July 14, 1913. Manitoba became a province of Canada, July 15, 1870. Second Battle of the Marne in World War I began, July 15, 1918. First mission in California established at San Diego by Father Junipero Serra, July 16, 1769. District of Columbia established, July 16, 1790. Mary Baker Eddy, founder of the Christian Science movement, born July 16, 1821. Scientists set off the first atomic bomb, Alamogordo, N. Mex., July 16, 1945. Spain officially turned Florida over to the United States, July 17, 1821. Spanish Civil War began, July 17-18, 1936. Samuel Colt, firearms inventor, born July 19, 1814. British Columbia became a Canadian province, July 20, 1871. U.S. astronaut Neil A. Armstrong became the first person to walk on the moon, July 20, 1969. First Battle of Bull Run, or Manassas, in the Civil War, July 21, 1861. Ernest Hemingway, American author and winner of the Nobel Prize, born July 21, 1899. Battle of Atlanta in the Civil War, July 22, 1864. Stephen Vincent Benet, American poet, born July 22, 1898. The Mormons settled Salt Lake City, July 24, 1847. Amelia Earhart, American aviator and first woman to fly the Atlantic, born July 24, 1897. George Stephenson first successfully demonstrated a steam locomotive, July 25, 1814. Louis Bleriot made first flight across the English Channel, July 25, 1909. New York ratified the Constitution, July 26, 1788. Playwright George Bernard Shaw born July 26, 1856. The first permanent Atlantic cable completed, July 27, 1866. Truce signed, ending Korean War, July 27, 1953. Amendment 14, which defines United States citizenship, was proclaimed, July 28, 1868. Alexis de Tocqueville, author of Democracy in America, born July 29, 1805. Booth Tarkington, American novelist, born July 29, 1869. First representative assembly in America convened in Jamestown, July 30, 1619. American social scientist Thorstein Veblen born July 30, 1857. Henry Ford, American automobile manufacturer, born July 30, 1863. First patent in United States registered, July 31, 1790.